The U.S. Mint launched the new Cumberland Gap National Historical Park quarter today at an 11 a.m. ceremony in Middlesboro, Kentucky. The Mint estimates that 3,600 people attended the event, 2,700 of which were school children. Local fourth-graders Hattie Landen and Makaya Patterson co-hosted the ceremony, which also featured U.S. Representative Hal Rogers, NPS Deputy Director Peggy O’Dell, NPS Director for the Southeast Region Stan Austin, and Cumberland Gap National Historical Park Superintendent Sula Jacobs. Of the 2,700 kids present, 2,200 were jointly sworn in as junior rangers. The Mint and Home Federal Bank also hosted a coin exchange program that saw members of the public trade $26,000 in cash for rolls of the new quarters. The Mint also hosted a Coin Forum yesterday afternoon at 3 p.m. ET at the C.V. Whitney Convention Center in Pineville, Kentucky. The forum gave the 40 collectors in attendance a chance to learn more about the Mint’s upcoming initiatives and weigh in on their ideas for future coinage. Cumberland Gap National Historical Park was established on June 11, 1940 and includes land extending into Kentucky, Virginia, and Tennessee. 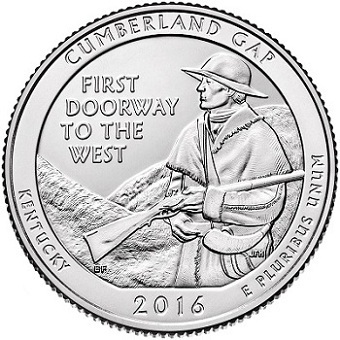 The Cumberland Gap Quarter is the 32nd release in the Mint’s ATB series, which will conclude in 2021 following the issue of its 56th design. All five of this year’s quarter designs can be viewed here. For more information on the America the Beautiful quarters program, please visit the Web site of the U.S. Mint.